Regardless of whether you work with PowerPoint on a daily basis, or create presentations only from time to time, Squirrel ProductivityTools provides you with over 80 useful features that make your life easier. Squirrel ProductivityTools lets you achieve more in less time. With Squirrel ProductivityTools, you can focus on the content of your presentation and spend less effort on formatting, aligning and other low-value tasks. 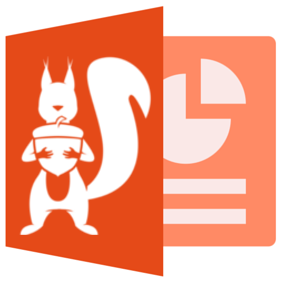 Squirrel Productivity Tools supports PowerPoint 2010, 2013, 2016 and Office 365. Download the free trial version and experience a new level of productivity with Squirrel ProductivityTools! Squirrel ProductivityTools provides more than 60 features you have always been looking for in PowerPoint. With these features you will spend less time on routine tasks. This frees up time for you to work on the content of your presentation or do other things. Enjoy your work efficiency, meet your deadlines, avoid stress, save time! All Squirrel ProductivityTools features are self-explanatory and very easy to use. There is no need to spend time and money on lengthy training sessions and voluminous instruction materials. With Squirrel ProductivityTools you can start being productive right away! If you still need some quick help, an user-oriented, easy-to-understand manual is available. Squirrel ProductivityTools is perfectly integrated with Microsoft PowerPoint and uses the familiar PowerPoint look & feel. You will work with Squirrel ProductivityTools just as if you were using standard PowerPoint…just much more productively. All users have two alternative ribbons (toolbars) available from which you can choose. For business customers we customize the ribbon and tailor it to your needs - free of charge! When you are looking for a PowerPoint productivity add-in, Squirrel ProductivityTools is the inexpensive alternative! The pricing is simple, transparent and affordable, also for private customers and small businesses. Compared to other products, Squirrel ProductivityTools has the best benefit-cost ratio. Save money on your office applications and spend it for the really important things in life. One of two alternative toolbars that users can choose when working with Squirrel ProductivityTools. For business customers we customize the toolbar free of charge. ‘Save and Send’ allows you to save your work, share it and collaborate with coworkers. The 'Save and Send' features also help you preventing loss of data. Save your presentation automatically on every slide change to prevent loss of data. ‘Edit and Format’ provides functions for smartly working on content and formatting of your presentation. Copy an object to a selection of slides. The ‘Alignment and Size’ functions help you to make your slides look tidy and professional. The 'Navigation' functions work like the navigation in your web browser and allow you to walk smoothly through your presentation without losing track of where you have already been. Create a meeting agenda or table of contents for your presentations in no time. The agenda can be updated with just a click and can be easily customized to your needs (e.g. to make it compliant with your corporate design guidelines). 'Excel Connectivity' allows you to create PowerPoint slides automatically based on a template slide and populate them with your Excel data, like a serial letter. Write any changes to the data on the PowerPoint slides (e.g. changes you make during a meeting or workshop) back to your original Excel table. 'Review and Organize' provides functions for checking and finalizing your presentation, alone and with others. Read the easy-to-understand manual and learn more about how to make the most out of the many useful features. From the Help/Options menu you can also easily switch the toolbar between two alternative designs that are available in Squirrel ProductivityTools. For business customers we customize the ribbon free of charge. 14-days trial version with full functionality. Limited availability of features after trial period. For everyone using PowerPoint professionally in a business environment. Please ceck out our free customization service for businesses and corporate customers. Click here to learn more. Want to buy many licenses? Contact us for volume discounts. After ordering you will receive the product key via e-mail. Please download Squirrel ProductivityTools and enter the product key when asked to do so. This will unlock your version of the product. Do you have questions or want to order via e-mail? No problem. Please contact us: order@squirrel-productivity.com. Squirrel ProductivityTools comes with two different toolbars. You can switch between the two at any time. For business customers who buy at least 3 licenses we customize the user interface according to your requirements free of charge. This allows you to re-arrange Squirrel ProductivityTools functions as you like or to combine PowerPoint standard features with Squirrel ProductivityTools features on one ribbon/toolbar. By request and individual agreement, we also develop new, additional features for Squirrel ProductivityTools or modify/extend existing features. These developments can be made exclusively for you. Please contact us at any time to discuss your individual needs and requirements. If you have any questions or need help please contact us on support@squirrel-productivity.com.